CJ Skid Steer Hire specializes in contsruction or building site clearances. CJ Skid Steer Hire strives to get your sites cleared as quickly and efficiently as is possible, we load using Skid Steers (Bobcats) and loads are removed using Tipper trucks therefor significantly reducing loading and removal times for your convenience. a Tipper Truck takes approximately 20 mins to load and all rubble is then dispensed of (in accordance with the law) at landfill sites. All rubble that can fit onto our bobcat is removable, and all rubble is charged per load. 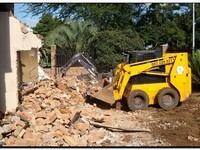 All rubble removal rates include loading with bobcat, removal and landfill costs.